I think everyone’s Dad has a car that reminds them of a special period of their life. In the same way that a certain song may transport you to a moment of happiness or a smell brings back memory of a good time; the mere thought of this car is enough to turn back the clocks for our Dads and put a big smile on their faces. 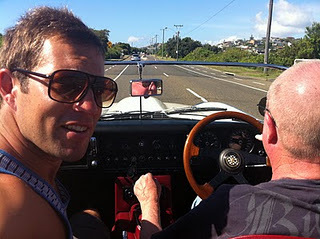 For my Dad, his car is the Jaguar E-Type. As a kid I remember him talking about this sports car as if it were a person. Slender, classic, fast and elegant; it’s a wonder my Mum didn’t get jealous. 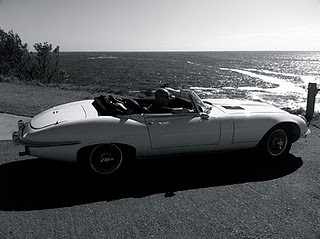 The E-Type in short was my Dad’s dream car. As most kids do, I remember telling my Dad that when I grew up I would buy him his dream car as a present. He laughed and played along of course, and only now, 20 years on, having just researched these cars for the first time, can I see why he found this so funny; they cost an arm and a leg. With no way of buying one at this stage, my only option was to try and hire one for the day. 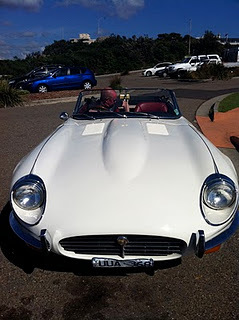 Luckily for me, the only E-Type in the whole of Australia that is hired out lives in a garage about 30 minutes from my house and so with a quick phone call last week I organized a surprise day out for my Dad in his childhood fantasy car. The car itself was a snow-white 1968 model, and laying eyes on it first hand it’s no wonder this machine holds a special place in my Dad’s heart. A rocker at heart, my Dad has always been a lone wolf, a maverick, and with a direct tie to England, this beasty Jaguar convertible represents everything about him. If you asked my Dad yourself, he’d tell you that it the E-Type was loosely modeled on him (I’d say that the closest similarity was that they both have nothing up top). My idea was simple; hide the car in his garage first thing in the morning before then knocking on his door and telling him I was taking him for a drive. Thankfully this is all went to plan and as he opened the garage door, I stood behind him awaiting his reaction. The result; silence, for about 5 minutes. I wasn’t sure if this was a good thing or not so I just stood there and watched as he circled the car, running his hand along the contoured bonnet as he went. Hilariously he later told me that the reason he remained speechless for so long was because he thought that I had actually bought him the car! Ooops. It was then I had to break to him the news that unfortunately we had to return it the same day. I felt terrible but as he jumped in the drivers seat and clutched the steering wheel for the first time, his smile made me feel better. My Dad, taking command in the driver’s seat, then started up the loud 6 litre V12 engine and gestured me to get in. It was time to go driving. This was the beginning of a day that I don’t think either my Dad or I will ever forget. 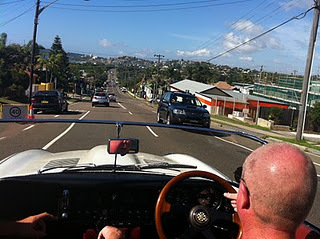 Now I’m not going to sit here and over-dramatize what was a simple drive around Sydney’s Northern Beaches. There were no high-speed car chases, no river-jumping and certainly no drag-racing, but to sit there and see my Dad shift through gears whilst cruising around in a world of his own was just awesome; he was in his element. 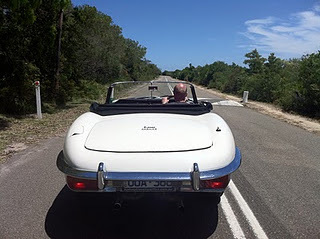 As he drove we spoke about everything including the first time he layed eyes on an E-Type back in 1964. Heading from Manly to Palm Beach on a beautiful day in Sydney’s Northern Beaches, everything had turned out perfectly but in all honesty we could have been anywhere and it wouldn’t have mattered; my Dad just kept on smiling. A few days on now since the drive itself and I spoke to my Dad briefly this morning. He just rang to say thanks. He told me that whilst in that Jaguar he had one of the best days of his life. It reminded him not only of his youth but it also gave him and I a chance to catch up like we hadn’t done in a long time. This I never thought about. Like I said, it was a day that neither of us will forget. 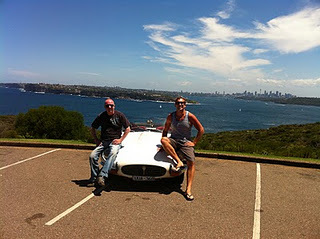 Thanks to Sydney Classic Car Hire for helping to make this day happen.